It was a brisk November morning, the clouds hung low in the sky coloured with ginger rays of sunlight trying to pierce through their dense cover. I stood at the corner of a sidewalk watching impatient drivers rocket through the intersection and wincing at the blast of an unexpected horn. Somebody rolled down a window and yelled obscenities at another driver for I don’t know what. The atmosphere was asphyxiated in turbulence. I turned my head and caught sight of a scrawled chalk message printed on a flat green panel of an electrical box. The blanched words were crammed into a limited space, and the misty morning had already begun the work of erasing parts of them, but they shimmered in the soft daylight – “happiness is a choice”. Living with RA, finding happiness can be like standing on a precipice with a narrow suspension bridge stretching into the distance and disappearing in a fog. RA is a miserable beast – it’s the albatross around our neck that drags us down, taunts us, and delights in twisting our lives. It can steal the fragments we have so carefully nurtured and place limits on our life. It can be hard to believe that happiness could still be a choice within the narrow borders of RA – no one could have been more surprised than me to learn that RA actually presented me with an opportunity to write big words in a small space. Looking back on life prior to RA, I thought I was happy. I had huge ambitions and like every young person I believed I had all the time in the world to achieve them. My choices were numerous and I could see them all hovering in the distance, just waiting for me to reach them – but I never did. I was active, healthy and able, and yet I spent years slinking around the edges of my vast boundaries, tasting only crumbs of my desires like an amuse bouche. RA swooped in and reduced my options by eliminating portions of my life I had only watched from the sidelines. To be fair, RA didn’t take my happiness, because I hadn’t chose to go find it. Instead it tapered my options, forcing me to work with what I had and what I could realistically achieve within the realms of my new boundaries. It wasn’t easy. It took a lot of energy to discover the gems in my new world. I had to actively seek them out and work with what I had. It took time and infinite amounts of patience, anger, frustration and anguish. I have achieved more in my life with RA then I did in the past – but believe me , I’ll still be one of the many to jump in line for that elusive cure if it ever comes to pass. I am simply grateful for what I have learned. 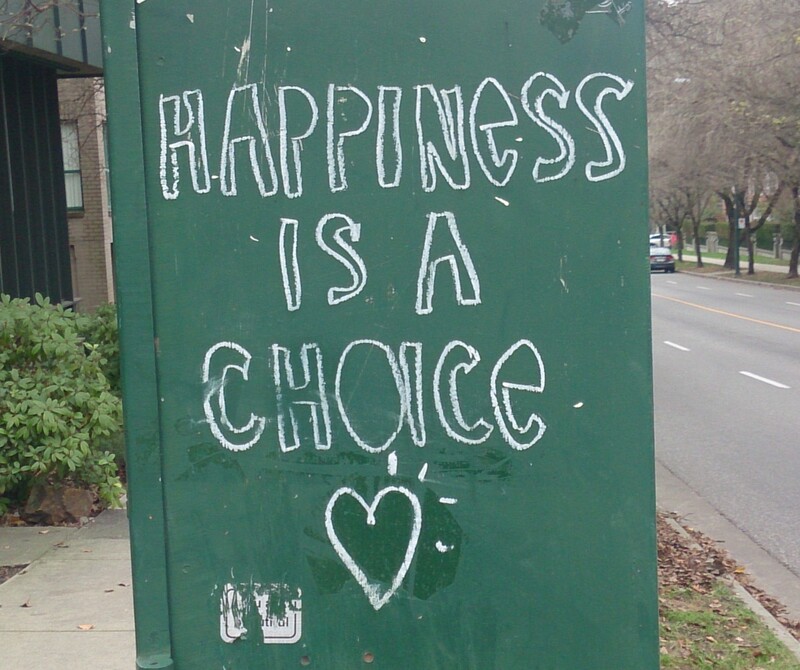 Is happiness a choice? I think happiness is what I make of it, seeking out small pleasures, filling a limited space with big words. Happiness is different from wellness. I didn’t choose to have RA, but I can choose where to focus my energy. I can find joyful moments in the small charms of everyday life – in a great story, in the rumbling purr of a cat, in the comfort of a cup of hot tea, in a visit with a friend, at a family dinner, in performing that one extra lap in the pool, in walking that one extra block, in picking up that coffee mug without strain (even if it is for just one morning) and in the glimmer of blue sky on a stormy day. I can find happiness in choosing to get up each morning, hold onto the rails and take one step at a time across that bridge without looking down into the rocks. I am capable of juggling a lot in my life, so why not throw a ball of happiness into the mix and see where I can catch it. Happiness might be as fragile as a chalk drawing, but it can last as long as I give it power. 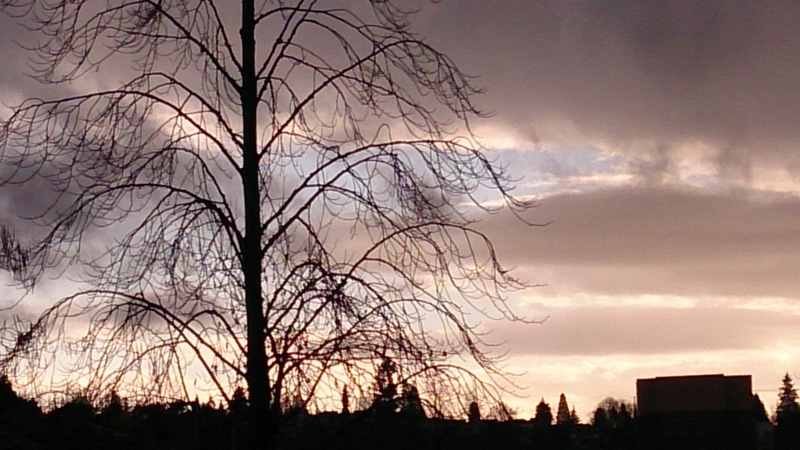 If I look for it, I can always find that streak of blue in the grey. I love this! I’ve always believed that, barring mental illness, we make our happiness from day to day, and that life hands us gems–for free!–if only we take a few moments out now and then to look for them. RD constantly tosses wrenches into the works, but even those can be catalysts for joy if we choose to look at them that way. Happiness is a choice. Thank you for writing and sharing another inspirational post. Thank you. I hope you are blessed with many moments of joy. Hugs, J.G.